Traditionally,some people are still likely to use the disposable coffee filters,when them brew coffee.Do you know the problem? It needs you to replace them frequently and replenish them, which will take a lot of your money and produce plenty of rubbish, Not environmental protection. Now, you never have to worry that you've run out of coffee filter paper again! ERZA SCARLET Coffee Dripper has a double mesh filter made of stainless steel, can solve this problem while preserving the natural and flavourful taste of the beans. It's eco-friendly, reusable and easy to clean, so you can enjoy brewing a fresh cup for yourself every morning. Do you know how to brew a delicious cup of coffee with ERZA SCARLET Pour Over Coffee Dripper ? 1. Simply put the pour over coffee dripper on top of your coffee cup. 2. Put two or three coffee spoons of medium or coarse ground coffee in the cone filter. 3. Pour hot water over the coffee and let the water drip through, it can drip slowly,and this is a normal phenomenon. If you do not want to wait and want it quickly, you can stir it with coffee mixing spoon. 4. Enjoy your coffee time. We guarantee that you will be completely satisfied with your ERZA SCARLET Stainless Steel Coffee Dripper. If for any reason you are not satisfied with your order, simply send it back for a refund. NO QUESTIONS ASKED! PERFECT TASTING - Fine-grade mesh prevent 99.9% of coffee grounds from entering your coffee cup, and keeps the taste of coffee beans natural nutrients, fresher taste, which makes you enjoy a clean,unmixed,delicious coffee. HIGH QUALITY - Reusable & Eco-friendly, top-quality 18/8 (304) stainless steel, say goodbye to always buying (and always throwing out) those paper filters. PREFECT DESIGN - The coffee dripper and cone coffee filter used separate, you can customize each cup of coffee by adjusting the grind level, temperature, and water ratio. Removable rubber grip design,safe & easy control，avoiding scald when pour hot water. STANDARD SIZE - Suitable for most mugs, cups, tea pots, carafes, and thermoses, perfect assistant for the home or office. 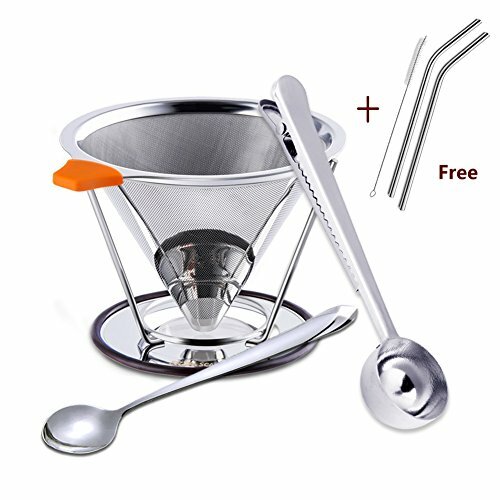 PACKAGE INCLUDE - stainless steel 1 cone coffee filter & dripper, 1 mixing spoon, 1 coffee scoop, 2 Straws & 1 Brush. If you have any questions about this product by ERZA SCARLET, contact us by completing and submitting the form below. If you are looking for a specif part number, please include it with your message.